UFX Review: Can You Trust Them? WARNING: We do not recommend UFX. This is due to a history of fines and sanctions in various countries. Please consider one of the alternative CFD brokers below. PLEASE NOTE: Currently, we do not recommend UFX (see why). Please consider one of our other regulated brokers. UFX is an online straight-through-processing (STP) brokerage firm that provides customers with a trading platform for Contracts for Difference (CFD) trading. CFDs are derivative securities that allow traders to speculate on the price of assets without actually holding them in their accounts. UFX provides its customers platforms for trading forex and CFDs on indices, commodities, shares, ETFs and cryptocurrencies. ParagonEx Web Trader 4.0: This web-based platform was developed by UFX for trading multiple classes of assets. ParagonEx Web Trader 4.0 incorporates MassInsights™ Technology, which is a UFX’s proprietary trading technology. It provides a complete live stream of market events and aggregated trader behavior. The idea is that traders can take the pulse of the market and see what’s moving different asset classes at any given time. UFX Trading App: A mobile version of the UFX Web Trader platform. 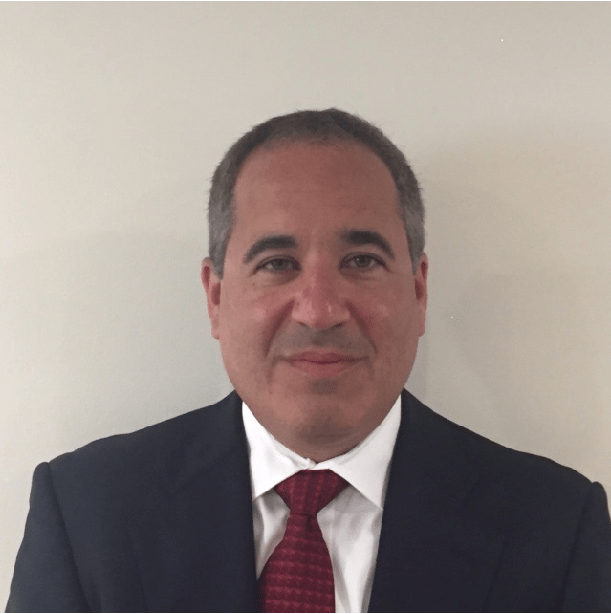 UFX emphasizes its ParagonEx platform, multiple account options and competitive trading conditions as its strengths. Traders looking for a broker that is regulated across the European Union and offers access to CFDs across several major asset classes may want to investigate the offerings at UFX. Please remember that trading CFDs exposes traders to the possibility of losses, which can exceed deposits. CFD trading is for experienced traders. This UFX review will cover all of the important details about the broker to help you make an informed opinion about its products and services. UFX is operated by Reliantco Investments Limited. The privately held firm based out of Limassol, Cyprus, was granted a license to operate in Cyprus on December 22, 2010. The firm was first established in the United Kingdom on November 30, 2013, under company number FC031723. It closed its UK presence on November 6, 2017. UFX is duly registered under the laws of the Republic of Cyprus with Registration Number HE 270726, having the necessary license and authorization by the Cyprus Securities and Exchange Commission (CySEC) with license number 127/10. UFX has headquarters at Reliantco Investments Limited in Limassol, Cyprus. The firm also has a branch office in the Czech Republic. UFX offers customers 24-hour customer support during the trading week to customers in multiple countries. Traders can contact customer service by live chat, email or local phone numbers in the various countries UFX serves. Reliantco Investments Limited (Reliantco), which is the company that operates UFX, is regulated by the Cyprus Securities and Exchange Commission (CySEC) with license number 127/10. The Markets in Financial Directive (MiFID) allows the company to operate as a regulated entity throughout the European Union. However, we would be remiss if we didn’t point out that Reliantco has been the subject of punitive regulatory actions by CySEC recently. On December 20, 2017, CySEC issued a financial penalty on the firm totaling €95,000. The fine imposed on the Company for their failings to act in the best interest of their customers follows CySEC’s initial supervisory action towards Reliantco. A fine is not an end-stop action for investment firms regulated in Cyprus, and CySEC will not hesitate to use all the supervisory tools at its disposal to limit consumer detriment. Reliantco notes that these are legacy issues that relate to past problems that they have remedied. They say that further follow-up inspections by CySEC show that Reliantco and UFX are complying with CySEC directives. In 2013, Reliantco settled with CySEC in the amount of €100,000 for other violations. CySEC also offers a provision of services to certain countries outside of the EU. All client funds are held in a segregated client bank account The Investor Compensation Fund may provide up to €20,000 if UFX fails. Cyprus is a European Union member and is a financial services industry hub. Customers in countries regulated by CySEC are eligible for compensation of up to €20,000 if UFX fails. UFX is a trade name of Reliantco Investments Limited, which is authorized and regulated by Cyprus Securities and Exchange Commission (CySEC License no. 127/10). Client funds at UFX are held in segregated accounts at top-tier banks. In addition, UFX uses Verisign SSL technology and layered backup systems in secure data centers in separate locations. As a result, UFX is able to secure customers’ personal information at all times. The Chairman of UFX is Dennis de Jong. UFX offers its customers financial instruments to trade that span six categories: currencies, commodities, cryptocurrencies, futures, stocks and ETFs. UFX offers six types of live trading accounts. The number of live trading options seems excessive. We’re generally not a believer in brokers having too many confusing account options since these usually come across as gimmicky. All accounts are denominated in US dollars. Customers of UFX can also open a demo account. Demo account holders receive a free eBook and $10,000 in virtual money. UFX receives its compensation in the form of the market spreads on each instrument. The broker is an STP (Straight-Through-Processing) broker, meaning it doesn’t take the opposite side of its customers’ trades. Instead, it hedges the trades it makes with its customers immediately in the marketplace. UFX offer fixed and stable spreads. The spreads for trading vary by the particular financial instruments being traded and the platform for trading. The following are the spreads for the most popular instruments by asset classes. Traders should contact Customer Support for custom spreads. Some currencies and commodities may not be available in certain regions. Although it is uncommon, UFX spreads can vary during extreme trading conditions or during non-trading hours. 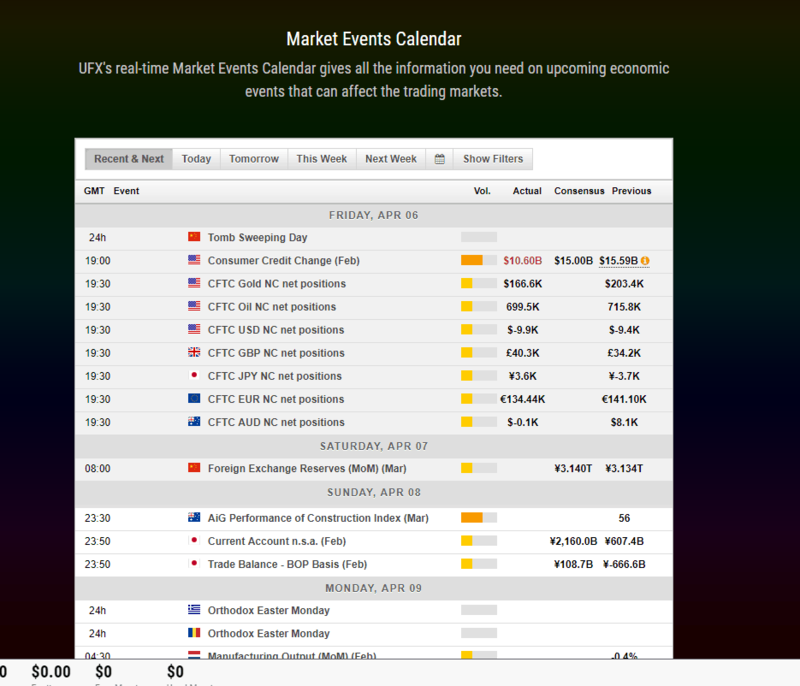 If you attempt to trade under these conditions, UFX will inform you on the platform of the relevant spreads. Commissions: UFX does not charge commissions on trades, only the spread for each instrument. Money transfers: UFX does not charge fees for money transfers. Maintenance fees: UFX does not charge regular maintenance fees, but it does reserve the right to charge a US$50 fee on open accounts once every three months. Inactivity fees: UFX reserves the right to charge an inactivation fee of US$50 when a client account has been inactive for a period of three months (and provided that the client has at least US$50 in their account). Overnight financing charges: This overnight fee (or credit) is either added to or subtracted from a trader’s account when a position remains open past a certain period of time. Traders can obtain information on overnight funding rates at the Trading Conditions section of the UFX website. Slippage: UFX advises that slippage is a normal market practice and a regular feature of the foreign exchange markets under conditions such as illiquidity and volatility due to news announcements, economic events and market openings. Therefore, trading according to news cannot be guaranteed. Deposit fees: UFX does not charge fees on deposits. Withdrawal fees: UFX does not charge fees for withdrawals. However, your bank may impose transfer fees. After you click the green “Sign Up” button the website, UFX asks you a few questions including your personal details and which type of account you want to open (see UFX Account Types section). Once you fill out this information, you are logged in to the trading system. You then can go to the drop-down menu on the right side of the screen to provide UFX with the information they need to verify your identity. You can also fund your account. The UFX compliance team checks all documents submitted for review and will notify you immediately if any document is missing, unreadable or unsuitable. UFX does not charge fees on deposits. The broker does not accept third-party deposits. If the initial deposit was made via credit card, UFX can only send a withdrawal to the credit card used to make the original payment. If the initial deposit was made via bank wire transfer, UFX can only send a withdrawal to the account from which the initial transfer originated. UFX offers leverage of up to 400:1 for many products. Each CFD also has specific UFX margin requirements that traders must maintain. You can see your free margin available to trade with on the UFX platform. Traders who fall below the UFX margin requirements risk receiving a margin call and having their position closed prematurely. To withdraw funds from your UFX account, you sign into your trading account, click on the profile avatar in the top right corner and choose “Withdraw Funds” from the drop-down menu. UFX will only process and transfer funds via the payment method you used to make your deposit. For example, if you deposited your funds with your credit card, the amount you wish to withdraw will be transferred to the credit card account from which the deposit was made. UFX does not charge fees for withdrawals. UFX requires withdrawal amounts to be more than $25 and less than the free balance you have in your account. Withdrawals take 3 to 10 business days to process. The UFX proprietary ParagonEx web-based trading platform has a different look than most other trading platforms. 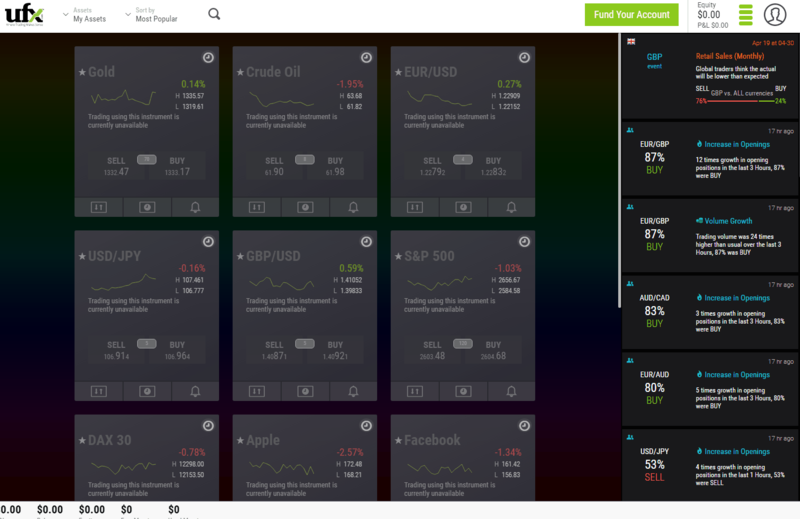 The main screen is organized with the grouping of instruments you can trade on the platform in the middle of the screen, the MassInsights™ Technology tools on the right of the screen and then two drop-down menus on the top left of the screen and an additional drop-down menu under your avatar on the right side of the screen. The drop-down menu on the top left allows you to sort the instruments by asset class, while the menu next to it allows sorting by most popular, alphabetically, by daily change and by volatility. The main screen seems a little clunky and busy. We think most traders would prefer having the traditional list of instruments on the left side of the screen and the ability to sort and organize this list as needed. Ultimately, a lot of screen real estate gets occupied by all of these instruments. Traders looking to focus on a smaller handful of instruments would probably prefer to have more screen real estate devoted to multiple charts or news feeds. Each instrument is laid out with the name on the top. 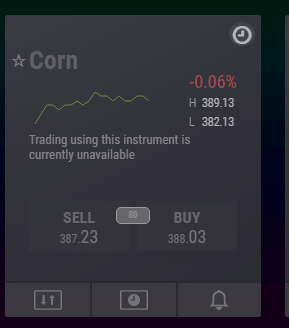 Traders can click on the star icon and add an instrument to favorites. There is functionality for setting alerts and a chart icon in the middle of each box. The charting functionality of the platform seemed to lag when we tested it on a fast internet connection. The number of technical indicators and drawing tools was more than adequate. However, the platform didn’t really impress with its ability to integrate the charting window with the rest of the platform’s functionality. The right side of the platform contains the timeline of insights generated by the MassInsights™ Technology tools. These contained statistics with sentiment indicators showing what other traders were doing. There are certainly many ways to incorporate these statistics into a trading model. However, it would have been nice if these stats were better integrated into the platform’s charting features. Another feature of this platform that makes it very different from most other trading platforms is the way you access the trading history in your account. Whereas most systems have this as a window on the bottom of the main trading screen, UFX has you access this from the drop-down menu on the top right of the screen. We think this is a major design flaw of the platform since most traders will want to see their closed orders while they are trading. When you open the Trading History section of the site, you get a screen with access to closed orders, closed positions, a statement and an account summary. To access each of these you have to set the date parameters using a calendar icon. It’s not clear where UFX lists open orders for traders. 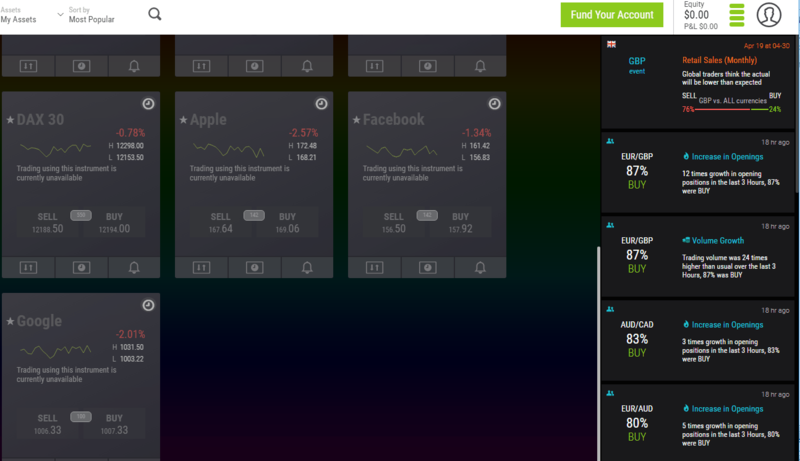 Overall, we found the UFX platform to be kind of confusing and awkward to use. While the MassInsights™ Technology sentiment tools seem promising, we wish these tools would have been better integrated into the other features of the platform. They seem, instead, to function more like a social media feed scrolling down the right side of the screen. 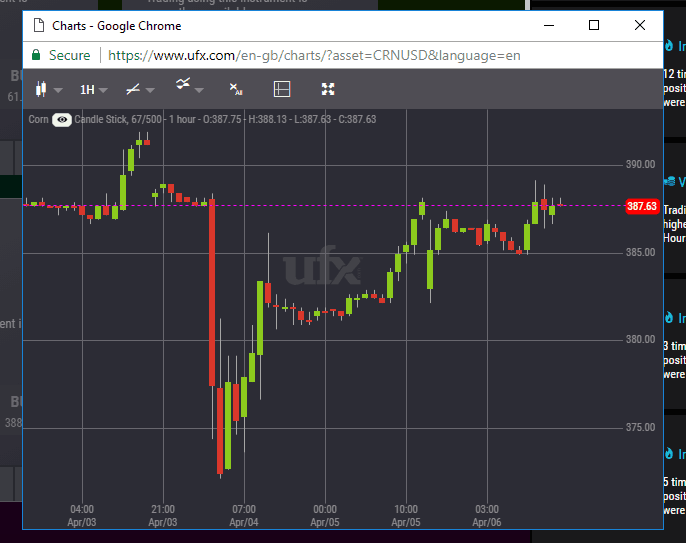 Traders looking for more advanced charting and automated trading tools may want to investigate the MT4 offerings of UFX. This platform has the look and functionality that many traders would find more familiar. Traders can open demo accounts with UFX for all of the different account options. Demo account holders receive a free eBook and $10,000 in virtual money. The demo accounts look like the live accounts, and traders can go back and forth between the two accounts from the drop-down menu on the right side of the main trading screen. Daily Market Review & Financial Analysis: This section of the site summarizes the main developments across the asset classes traded on the platform. The analysis has an almost exclusive focus on technical factors moving the various markets. Economic Calendar: A review of key upcoming events and announcements that have the potential to move markets. UFX doesn’t list any sign-up bonuses or promotions on its website. However, the broker has offered these in the past. As of January 2018, however, brokers that are regulated in the EU are unable to offer sign-up bonuses to entice new customers. This is due to the MiFID legislation, mentioned previously, which has been imposed to provide traders with greater transparency in the markets. Therefore, any broker offering this type of incentive is either unregulated in the EU or perhaps isn't regulated at all, meaning your money may not be protected and the broker in question could be operating illegally.